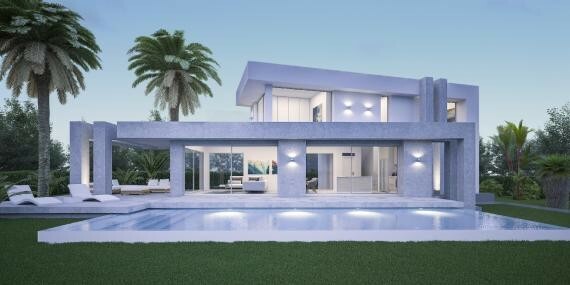 This lovely Villa was designed to be built on an 1000 m2 plot , enjoying an excellent location in the urbanization Monte Olimpo, close to Javea. The entrance to this two level villa with double high is located on the ﬁrst ﬂoor. Here you will ﬁnd a spacious and bright living and dining room with an integrated fully equipped kitchen. On this level there also are two comfortable bedrooms with integrated wardrobes and a bathroom. On the second ﬂoor we have a master bedroom with a bathroom in suite and access to a private terrace. The property has large terraces (120 m2) and an beautiful swimming pool, creating a perfect place to relax and enjoy. The house is designed with ﬁrst quality standards by using the best materials. The house has air conditioning and underfloor heating system, integrated wardrobes double glazing. A beautiful garden surrounds the house with panoramic views to the valley and the Montgo.